We at Scala Playhouse would like to express a massive ‘Thank you!’ to all the visitors of the Tropical Temptations themed Scala Fair. The fair was once again a big success for us and our suppliers; and we couldn’t be happier about all the compliments we received about our products, decorations and entertainment! The Tropical Temptations Scala Fair certainly managed to seduce its audience with the hottest deals and sizzling offers. The Cash & Carry was once again one of the most popular features of the fair; with visitors queuing up early in the morning to secure themselves the best possible deals. Besides amazing offers and prize-competitions during the Scala Fair, visitors were also treated to special treats such as an exotic smoothie bar serving refreshing drinks. Customers and suppliers sipped on coconut smoothies and virgin mojitos, while enjoying the buzzing atmosphere. We at Scala Playhouse were very proud of the introduction of our newest line extensions LUZ by TOYJOY and The Rabbits by TOYJOY. Both received a lot of positive feedback from the Scala Fair audience. Many were amazed by the one-of-a-kind LUZ by TOYJOY darkroom; which enabled customers to view the ambience LED-lights in the LUZ by TOYJOY toys literally light up in the dark. The exotic theme was beautifully reflected in the showroom decorations. Visitors could relax in hammocks on a special indoor beach, while listening to a real waterfall and admire our gorgeous lingerie models. This edition also featured a male model, who certainly managed to raise a lot of temperatures! We are thrilled that this Scala Fair was such a success and want to thank all our valued visitors and business partners who made the effort to travel down to Almere to grace us with their presence. Thanks for all the great support! 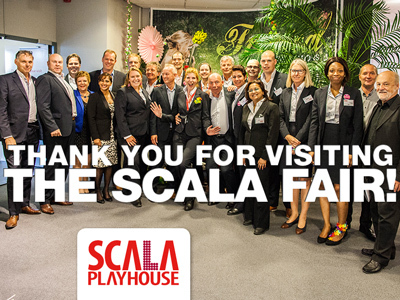 We hope you enjoyed this fair as much as we did and are already looking forward to the next Scala Fair on the 13th and 14th of March 2016.